Sometimes a thought or small idea is good enough to change the direction of life. 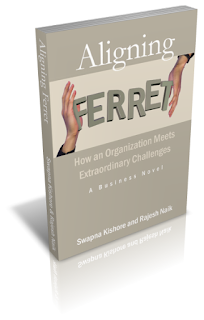 A few months back, I had an opportunity to read a business novel Aligning Ferret : How an Organization Meets Extraordinary Challenges by Swapna Kishore and Rajesh Naik. I enjoyed reading it. I found striking similarities with situations I encountered while leading initiatives in several organizations. It describes an exciting journey of an organization beyond the operational processes and how the organization transformed itself as a real business powerhouse, surmounting several obstacles. I read this book while I was offering consulting on IT. I was always amazed by the power of IT in transforming business. However, I was also looking for an area to focus on. Aligning Ferret clearly brings out how clarity of strategy supported by a measurement system can have a significant influence on the organization performance. It highlights how tools/methodologies such as Balanced Scorecard and People CMM can be used to address issues faced by several organizations today. I must say, reading this book influenced me to choose Business Dashboards as an area of focus for my consulting offering. Several organizations face a peculiar situation, on achieving certification of operational processes (like CMMI and ISO). Clients’ expectation go up. Organization thinks they can relax for some time before taking up an improvement initiative. Some of the QA resources are pulled out for ‘revenue generating’ projects and some QA resources leave the company. Even when the celebration is going on, the core delivery process may be operating at level 5, but the enabling processes such as hiring and performance management may be operating at level 1. Often, the combined forces bring quality level back to square-one in a few months time. So, another improvement initiative is undertaken, typically without linking it to the “big picture”. Aligning Ferret is a wonderful business novel that packs not just several interesting events and humorous situations, but also several deep insights for CXOs, Delivery Heads, Quality Professionals and Project Managers, in their journey towards the next level of excellence.